I am so happy with my latest creation! 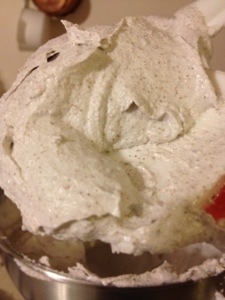 I’ve wanted to make a scrub with better exfoliation than my usual sugar. I love my sugar scrubs, especially for myself, but with Larry as my guinea pig I knew that some people needed something a little stronger. I found a basic recipe that I decided to start with and then tweak because we all know I can’t leave things alone. *grin* I used the pound of pumice that it called for (wow!) and the soap, but added more glycerin since I knew I’d have more dry ingredients than their recipe. Then I figured that I’d almost match my new formula of mechanic soaps, so I added finely ground apricot seeds and my new poppy seeds. To up the gentle exfoliation I added a few cups of sugar too. I also made a really nice scent blend with pine, sandalwood, and crackling firewood. It smells so manly, yet still a bit mellow. I am really enjoying it! Posted in Bath Products (non-soap) and tagged body, Homemade, spa. Bookmark the permalink.